I consider the Hitachi C10FCH2 15-Amp 10-inch Single Bevel Compound Miter Saw with Laser Marker a pretty good choice for my needs. As I have previously bought some tools from Hitachi, I oriented myself towards this manufacturer for a miter saw. I have to say that this unit does come out running right from the packing. No hiccups, no fuss and the cuts are pretty deep and accurate, just what I needed. I do realize this might not be the model for everyone, but I wanted to write this review anyway, if only to give you a clearer perspective on this model and what I consider a good miter saw should have. Types of Miter Saws - Which One is The Best? I am really into making small pieces of furniture at the moment, and the only thing that was missing from my tool collection was a good, trustworthy miter saw – at least up to a month ago. I needed one that had a pretty powerful motor and an above average level of accuracy while still being within the limits of my budget. As I have previously owned and still have some Hitachi tools, I decided to look into some of their miter saws and see if one of them met my expectations. The Hitachi C10FCH2 15-Amp 10-inch Single Bevel Compound Miter Saw with Laser Marker seemed to hit all the check boxes and even if I’ve only been using it for a month, I don’t regret the decision to purchase it. The cuts are extremely accurate thanks to the laser system, not just above average like I desired in the beginning, which is great from my perspective. It also comes with a fair amount of accessories and I find it a great starter kit for a newbie. I kind of wish I had one such unit when I first started working with wood. I find that the Hitachi C10FCH2 15-Amp 10-inch Single Bevel Compound Miter Saw with Laser Marker is a pretty powerful and accurate miter saw. I dare to say I would recommend it even to professionals, as the only thing you have to do is get it out of the box and start cutting. I find that you could easily trim out a house with this particular unit. Beginners will also like this miter saw as it’s pretty easy to use and comes as a complete package – accessories and safety devices included. A good little starter pack for first time buyers. Miter saws are, arguably, the most popular saw types on the market. Quite versatile and useful, they can take on a wide variety of projects. Whether you are a professional contractor, a carpenter, a DYI aficionado or are just trying to remodel your home, chances are you have encountered a miter saw before. This depends on the requirements of the project you have on hand. No matter how high-tech or high-quality a miter saw is, if you are just going to use it once for building a dog house and then forget you have it, do not buy it. Opt for a cheaper, simple to use model. These ones are mainly used for cutting trim and making miter and cross cuts. Their capacity is quite limited and there is obviously no bevel option, meaning you will not be able to make a wide range of cuts. It’s best you opt for this model if you are only trying to tackle simple projects. The main feature of this second model is that it allows you to make bevel cuts. They are easily adjustable to go back and forth from miter to bevel cuts. This type is perhaps the most versatile one out of the bunch. Though typically the most expensive ones, these saws have all the benefits of a compound saw plus the added perk of a sliding arm. This sliding arm permits the unit to cut wider, thicker pieces of material. If you will not be using your miter saw on a regular basis and on larger, more complex projects, it’s best if you do not try to purchase one. It would be a pretty costly investment after all. If you use your saw on a regular basis, it is best you choose a motor with 15 amps. If not, a 10 amps one will work just fine. Most saws come with their very own, standard quality blade. However, depending on your work, you might want to replace it with a better quality one. Saws, even simpler models, can be quite dangerous to work with. The perfect option is a miter saw equipped with both fence guards and electric brakes. Reading some reviews to see if these items are effective is also a good idea. This miter saw from Hitachi comes with the added bonus of a laser marker system allowing an increase in the cutting accuracy. The motor is quite powerful coming up to 15 amps. The meter range allows for 0-52 degrees to the right as well as the left increasing the flexibility of the cuts. And while this unit only bevels to the left, allowing a 0-45 degrees of angle range, this fact does not take anything away from its overall performance. Another great feature comes in the form of a horizontal handle coated in a vibration reducing, soft elastomer, ensuring a better grip and an easier transportation to the jobsite. The saw’s large pivoting fence raises up to 4 inches, great for cutting crown molding vertically, and the thumb actuated positive stops will make any miter adjustments easy and quick. As a plus, this item comes equipped with some much needed accessories – a 10" 24T TCT saw blade, a pivoting flip fence, a dust bag, a vise assembly, a 10mm box wrench, a 4mm hex bar wrench and a material support extension. This is perhaps the C10FCH2’s best feature. The exclusive laser marker system will ensure you get perfect cuts through a variety of wood types, no matter the density. The laser can be activated long before the blade is in motion for having an exact alignment. The only fault here will lay with your measurements. As long as they are exact, the cuts will be exact too. The thumb actuated positive meter stops will permit you to adjust them in a simple manner (from 0 to 52 degrees). The overall high-performance oriented design will allow you to easily change the angle of the blade, perfect for cutting miters in crown molding or any other trim places for that matter. This unit will also provide perfect bevels on the first try, thanks to the bevel range of 45 degrees. This miter saw’s motor is a 15 amps one, allowing for 5,000 rotations/ minute. This is particularly great for making miters and crosscuts with ease, regardless of what the job entails. As I am normally not a very spontaneous person, I decide to do my fair share of homework and research before jumping in and purchasing a random miter saw. There are quite a lot of such units readily available on the market after all. 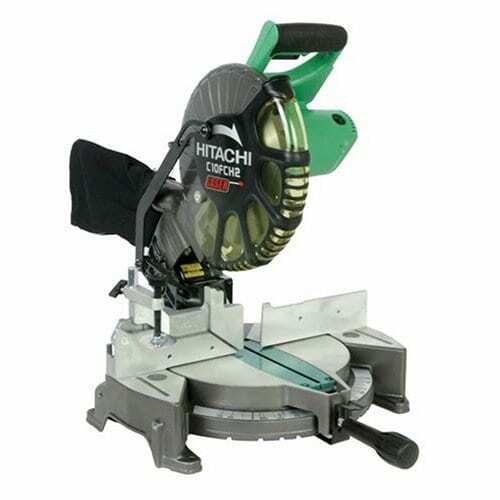 Long before compiling a shortlist and finally picking the Hitachi C10FCH2 15-Amp 10-inch Single Bevel Compound Miter Saw with Laser Marker, I actually took the time to read every single review on every single miter saw I could imagine. Needless to say, they all have hundreds upon hundreds of reviews, some good, some bad and some just in between. But first thing is first. Let’s start with the good ones. To no surprise, most previous users raved about the high-precision laser system, a feature I was deeply interested in. also, there seems to be none of the unwanted wobble some other models usually have. Others praised the overall performance and power of the Hitachi, saying that it cut squared barely out of the box. And while the incorporated blade is not fantastic it does its job pretty well. That being said, most users opted to put a different, more suitable blade on their unit. Even though I am a little bit stuck on the Hitachi C10FCH2 15-Amp 10-inch Single Bevel Compound Miter Saw with Laser Marker, I still decided that having a few extra options never hurt anyone. This model from delta is a fairly lightweight unit, allowing for an easy transportation to any jobsite. The ergonomic handle provides a better grip and ensures a safer, somewhat predictable operation. One of its most prominent features is the spindle lock that holds it securely while the blade nut is loosened and then removed. As for capacity, this miter saw is able to cut nominal 4 x 4 and 2 x 6 boards when at 90 degrees and 2 x 6 ones at the bevel setting with just one pass. All in all a pretty good option to keep in mind as it will virtually work with any miter saw stand, no matter the brand. Another option to check out is this miter saw from Black and Decker. Both compact and extremely easy to carry, this unit is ideal for cutting crown and base molds. Coming up to only 17 pounds in weight, this might be the preferred model for many smaller-framed people. The miter range is about 0-45 degrees both left and right and it holds 9 positions. All the features ensure you can use the unit for pretty much everything, from trimming and framing to different craft projects. Coming from Dewalt, the DW715 model is both sharp and thin allowing for better cuts. Equipped with different accessories – a carbide blade, a blade wrench, a dust bag and comfortable side handles in the base – this unit will be able to handle most if not all things you throw its way. One of its best features is the miter detent override, allowing you to easily override miter stops and adjust to any desired setting without the actual saw slipping into the miter detents. Also from Dewalt, the DW713 has a pretty powerful motor for its size, a 15 amp one that provides about 5,000 rotations/ minute. The incorporated stainless steel detent plate has 11 positive stops and helps in providing a high level of accuracy that can be repeated every single time. This saw unit was specially designed to deliver very quick and accurate bevel cuts measuring 0-48 degrees to the left and 0-3 degrees to the right. The Hitachi C10FCH2 15-Amp 10-inch Single Bevel Compound Miter Saw with Laser Marker is a very good choice from my perspective. As I am mainly working with small pieces of furniture, I wasn’t on the market for a larger saw. Though not great at cutting very large, thick panels of dense wood, I find this unit a pretty good one for my needs. And, yes, I haven’t been using it for a very long time to attest to its durability, but, up till now, it has done its job admirably. All in all, the Hitachi C10FCH2 15-Amp 10-inch Single Bevel Compound Miter Saw with Laser Marker is a good investment.